An artist's illustration of a Breakthrough Starshot nanocraft sailing by the potentially habitable exoplanet Proxima b. The biggest hurdle to mounting an interstellar mission may be humanity's short attention span. It'll take several decades of sustained, focused, coordinated and costly work to pull off a project such as Breakthrough Starshot, which plans to blast fleets of sail-equipped robotic nanocraft toward potentially life-supporting exoplanets at tremendous speeds using powerful, Earth-based lasers. "That's the part that worries me: What's going to keep us motivated, and keep us kind of organized, and keep us pushing forward?" added Manchester, who's an assistant professor of aeronautics and astronautics at Stanford. The Starshot project endeavors to launch its first craft within 30 years. 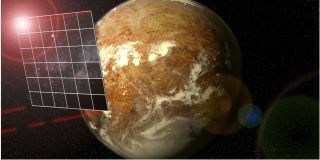 If all goes according to plan, these bantam pioneers will get up-close looks at Proxima b, the possibly habitable planet that circles the sun's nearest star, the red dwarf Proxima Centauri. Other probes will target other nearby alien worlds in relatively short order thereafter. The Starshot project is investing $100 million, provided by Russian-born billionaire Yuri Milner, in research and development over the next half decade to determine the feasibility of the laser-sailing plan. But full-on interstellar exploration will cost considerably more. For comparison, NASA's Apollo program cost about $25 billion over its lifetime, which is more than $100 billion in today's dollars. Beaming the images and other data collected by the miniprobes home to Earth, which the Starshot team aims to do using the sail as an antenna, will be no walk in the park, either. So there will be significant technical challenges to overcome, in addition to the economic, cultural and sociological concerns raised by Manchester. But interstellar exploration isn't supposed to be easy.